linuxtv-dvb-apps from https://www.linuxtv.org/ might not be necessary but you get lots of small programs to help configuring the dvb. Hauppauge WinTV Nova-T USB is on the market with different chips inside. Type lsusb (usbutils package) and when you get 2040:7070 inside the string Bus 001 Device 004: ID 2040:7070 Hauppauge Nova-T Stick 3 then the following tells you how to install it. It requires the firmware https://linuxtv.org/downloads/firmware/dvb-usb-dib0700-1.20.fwthat is downloaded into the usb device plus the kernel driver dvb-usb-dib0700. This rises a GPL problem since the firmware is not open source. The firmware has to be put in /lib/firmware. and then verify what emerged would do by emerge -pv linuxtv-dvb-firmware and when happy do it. Check if /dev/dvb/adapter0 got created. Check dmesg to see if it is happy and the firmware gets loaded. What is missing now is a media player that can show dvb-t.
DVB-T comes with EPG, make sure that the timezone is set correctly on your computer. This dvb receiver has an internal infrared receiver (even when not shipped with a IR controller). It is not visible from the outside. When evdev runs it is reported and it even works on the fly. When you set up LIRC with an self made receiver, then you might wonder why everything key comes up twice (and even correctly converted due to evdev as the number keys). Many application can not scan for channels and rely on a channel file that holds all the channels. There are programs that can create the a channel file themselves. However for command line tools to be used in applications as totem the official media player for gnome it has to be done separately. Copy or link the channels.conf file to ~/.mplayer (or/and ~/.xine for xine and totem). If you run into difficulties, you might do it in two steps to determine where the problem is. Open one console and after emerge linuxtv-dvb-apps run tzap to tune: tzap<channel name>. The dvb-t tuner should be able to tune to that channel. If not you have a problem with the receiver or the channel file. Mplayer works well but it is a command line tool, therefore gui tools are desired. Unfortunately those gui tools often have difficulties with the channels.conf and therefore fail and additionally it seems that they always change the way how they handle channels.conf. kaffeine works well with dvb-t and has even a channel search and record schedule. In VLC the easiest way is opening the file channels.conf (maybe it is in the hidden .mplayer directory, so it needs to be moved, linked to a non hidden directory or just type .mplayer as file name and hit enter). After that the first channel pops up, the other channels can be selected via View > Playlist. To get dvb for gnome see http://wiki.gnome.org/DVBDaemon, set the totem useflag if you want to use it with totem. Consider to set the vala useflag since the gnome-dvb-daemon is written in vala. After unmasking lots of packages emerge gnome-dvb-daemon. There is smplayer a gui that does not depend on the desktop environment. In xine the channel.conf needs to be loaded as playlist and then play should do the work. There is a snapshot (camera) icon in the control gui. Many tools as vlc record *.ts files that are very big and therefore need to be converted to compressed video in an second step using tools as ffmpeg. If you have a bad signal you might end up with an outdoor antenna with integrated amplifier. If you have good signal you might even consider to build your own antenna. 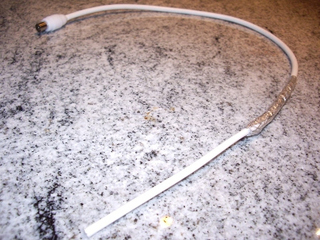 Just take a coaxial cable and take off about 12.5cm from the outer plastic coat. Bend back the metallic screen and fix it with a tape to the cable. That's it. It might work better than a commercial antenna. Speed of light / dvb frequency /4 * k.
The factor k (=0.95) considers that the signal on the antenna itself is lower than the speed of light (Thanks to Mr. Einstein). The dvb signal has a frequency around 600MHz.